Quote: "Interestingly, they're chamfered on one edge, so are effectively handed and have to be fitted the right way around." I’m surprised it failed on those pads not just an advisory, unless the others are worse. No, the fronts are fine. This was, by far, the most thorough MOT that I've put a car through, though. I used a Council-run facility and everything was absolutely by the book. 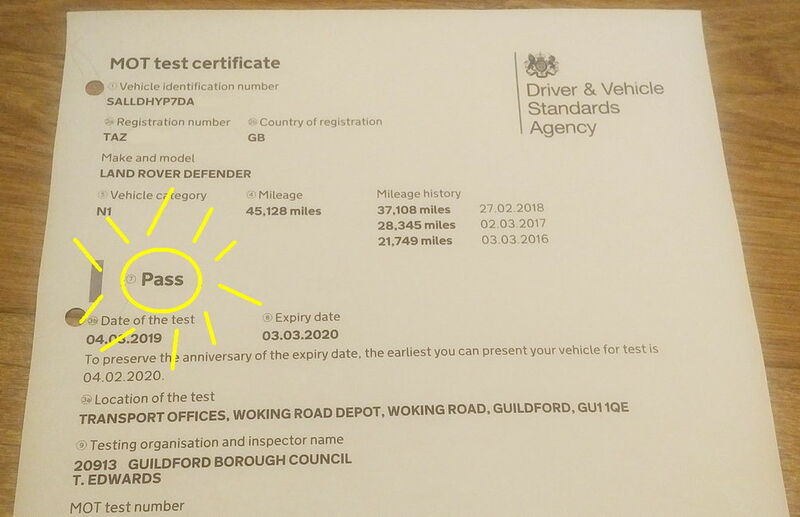 Just to be clear, I'm not complaining about a thorough MOT. In an ideal world, they should all be like that. 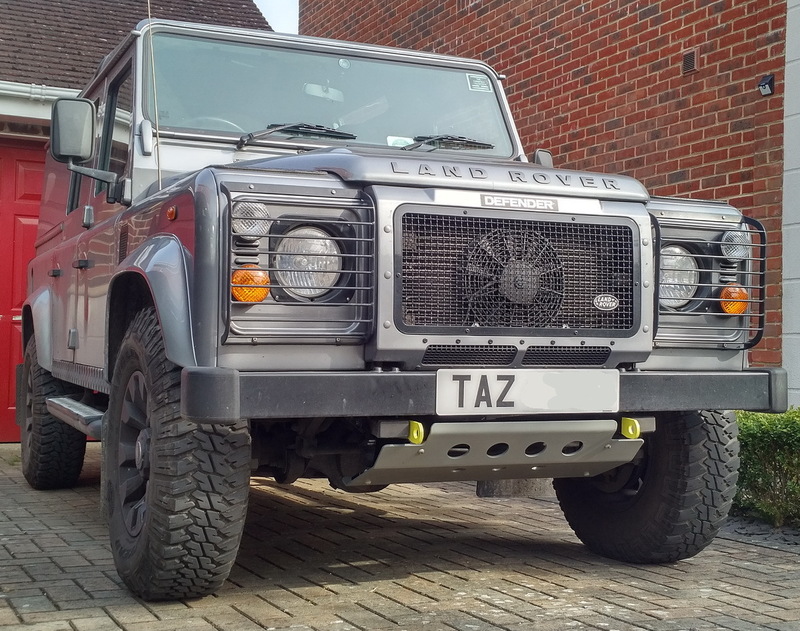 for me its the daft things, if you had seen the advisories he had put on the defender, and the 306 you had to laugh at!! Nice pic LRA 1996 Golf Blue 300Tdi 110 Pick up. Keeper. With the weather dry and relatively warm, and a bit of spare time, today I've fitted a steering guard. It's a three piece steel galvanised affair as supplied by First Four Off Road, although I bought it from VVS210 of this parish. It's a substantial bit of kit - 10mm thick brackets and 6mm thick guard plate - and so when I collected it from him at Newbury it was 'kin heavy to carry back to the car park! Whilst it has a galv. finish, I didn't want to leave it like that and so have spent a bit of time over the last week cleaning, priming and spraying it. 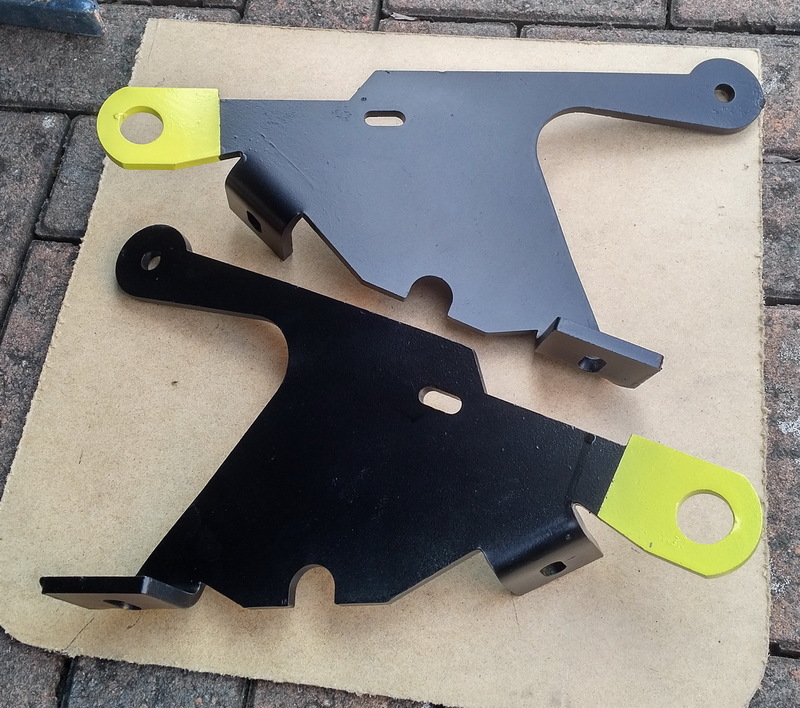 The chassis brackets are now black with yellow highlighted towing eyes, and the guard plate has been coated with grey enamel. Fitting was relatively straightforward apart from the weight! The chassis brackets bolted on easily enough using the bolts for the original lashing eyes at the front (which have very nice captive washer nyloc nuts) and one of the steering box bolts on the drivers side along with a new M8 bolt on the passenger side at the rear. 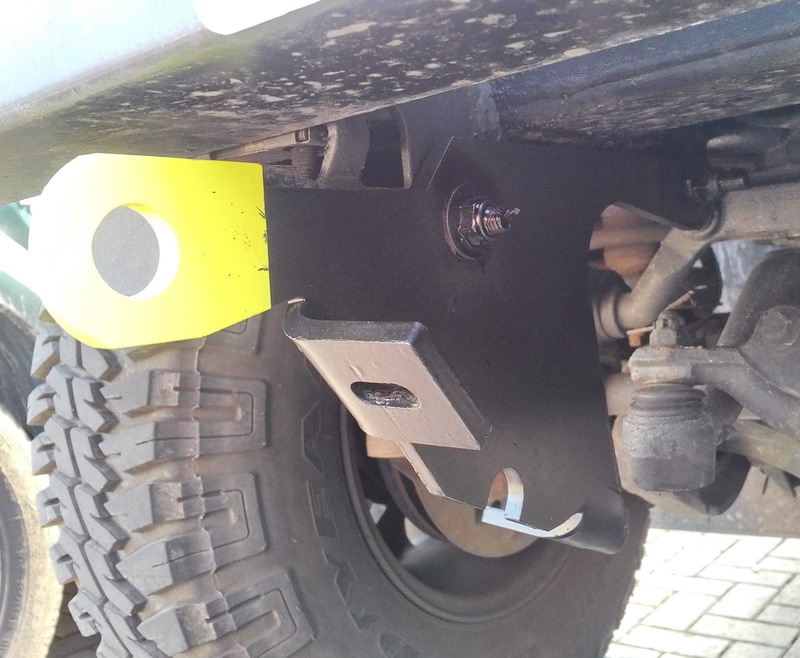 Because of the vagaries of Land Rover chassis tolerances, it was necessary to leave the chassis bracket bolts loose and attach the guard plate before tightening everything up, as otherwise the holes wouldn't line up. Fiddly but not the end of the world. All mating surfaces and bolt tubes were given a squirt of Dinitrol before assembly and I also fashioned some dense rubber pads to fit between the brackets and guard plate. It's difficult to know how much difference the latter will make but it was easy enough to do and might help with NVH as the guard makes the front end extremely rigid. Fitted new felts to my sliding rear windows. Nice easy job and windows are now completely rattle free. Haven’t driven it yet, but would imagine it should be quieter and hopefully warmer!